If you have heard people claiming to have travelled in Pakistan from ‘one end to the other’, take it as no more than a figure of speech. I thought such a sweeping contention should, for a start, entail a boat ride to the fabulous Astola Island in the Arabian Sea, 30 miles south-east of Pasni; and, no amount of travelling inside Pakistan’s heartland can be considered complete unless the sojourn is rounded off with the ultimate feat of reaching the northern-most latitude of the country. That extreme geographical point was the goal of our two-man bicycle expedition last May, so we could proudly flaunt our ‘end-to-end’ travel credentials. Most ordinary maps show a small kink jutting into China, a few miles north-east of the point where Pak, Afghan and Chinese borders meet, being aptly described by the British explorer Colonel Schomberg as the ‘solar plexus of the mountain system of Asia.’ Astride the kink is the 15,840-ft high Kilak Pass, which fans out northwards into a sprawling snow-clad pasture. Here, herdsmen from Pakistan’s northern-most village of Misgar come to graze their sheep and goats, when the melting carpet of snow starts to uncover the rich herbage in May. 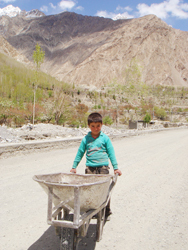 Up to the end of the 19th century, the pass was infrequently used by traders from Gilgit and Hunza to sell dried fruit and, of all items, wretched slaves – with the acquiescence of the heartless local rulers – to caravans plying between the fabled oasis towns of Western China and Afghanistan’s Badakhshan province, and beyond. Much of the goods from China, however, came through the nearer Mintaka Pass and, included silks, printed textiles, carpets and jade products, mostly destined for the ruling elite of the region. Like most mountainous passes, Kilak and Mintaka were also notorious for being hideouts for brigands to waylay caravans laden with those exotic wares. Some of the infamous outlaws of Gilgit and Hunza had spent their useful years prowling the crags and defiles of these passes, while living off the land in the company of wild animals and, lashed by bitterly cold winds. I could almost hear the nervous whistles of marmots scampering about at the snarl of a hungry snow leopard in that mountain vastness, as I started to plan the expedition. When I broached the subject with my friend Shahid Dad, last year, he seemed sufficiently enthused. “Would you be willing to bike all the way from Gilgit to the extreme north of Pakistan?” I inquired carefully, lest he take it as an indolent suggestion. The strong fighter pilot bond we had shared in yesteryears came through when he emphatically replied in the affirmative. When he added in his usual scholarly manner, “Age doesn’t matter, the heart is still young”, I knew I could take comfort, knee joints and all! It was summarily decided that Shahid would be returning from Boston the following May, especially for this expedition. I promptly purchased lightweight mountain bikes for the two of us from Nila Gumbad, Lahore’s crowded cycle mart. Getting those ‘retired’ muscles back to vigorous work was a challenge, and the coming months saw me pedalling feverishly every morning on the outskirts of Lahore, while Shahid was mostly confined to a gym due to severe cold weather in Boston. The expedition was to last a full fortnight, from Gilgit up to the northern limits of Upper Hunza Valley and back in 50km daily stretches, so the demands on endurance and stamina had to be painstakingly catered for. While physical conditioning was underway, the equally important planning aspects were looked into, critically. Choice of route, basically dictated by suitable night stops, was followed by selection of nearby inns, motels or camping sites; geographical coordinates for GPS, climb gradients, astronomical and weather data were then gathered. Most important, satellite pictures from Google® earth, which could be viewed in amazing 3-D ground-level panoramas, were downloaded, carefully analysed and then uploaded into our mobile phones for enroute correlation. With a Mandarin vocabulary limited to nin hao and xiéxié, explaining a border violation to Chinese guards would have been a disaster; good navigation was, thus, the key to a successful mission. The problem of Acute Mountain Sickness also had to be tackled. The earliest mention of this sickness is known to have been made by a Chinese official by the name of To Kan in 32 BC, while he was touring in the vicinity of the Kilak Pass itself. “A man’s face turns pale, his head aches, and he begins to vomit,” observed To Kan. This malady afflicts even the very fit mountaineers if the rate of vertical traverse is more than 2,000ft in 24 hours, above an elevation of 8,000ft. Such a situation was going to be encountered during our last leg. So we decided to break it up at the half way point. With the vitals adequately taken care of, we were rearing to go. On April 26, I departed for Islamabad where I met up with Shahid who had arrived from Boston a few days before. Next morning, we boarded PIA’s ATR-400 turbo-prop for Gilgit under command of a very helpful and friendly captain. The bikes had been transported to Gilgit by road earlier, as the baggage hold of the ATR-400 was found to be too small for bike cartons. In Gilgit, we promptly assembled the bikes and went off for a familiarisation spin to the nearby town of Nomal, which we nostalgically remembered having passed by nearly four decades earlier, while on a tough route march during a survival course as cadets. 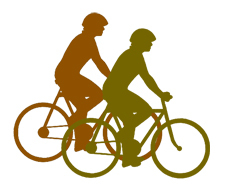 Riding the rather dazzling bikes — what, with Darth Vader helmets and chic Polaroids® to complete the striking figures — we must have looked like creatures from Pluto, as we swished past the curious bystanders. After returning from the test run, we rigged the bikes with pannier bags, tents and sleeping bags and, carefully calibrated the bike computers to help us keep track of speeds and distances during the expedition. Finally, on April 30, we set course for our first destination, Chalt. The Karakoram Highway (KKH) was in good shape and pedalling seemed like a breeze. The resplendent Common Magpies (Pica pica) in their black, white and iridescent green feathers were to become a common sight throughout our trip. Said to be the most intelligent of all birds — being from the clever crow family — they cackled and quacked delightfully as if welcoming us to their garden localities. A more hearty welcome came from the village children who would run alongside our bikes, chanting, “Hello, one penny please.” We’d respond with salaams and good wishes in Urdu, but some of the kids would insist that we were angraiz and, would keep on pestering for pennies! After a tough 50km leg, we approached Chalt by a suspension bridge and, to get our legs in normal working order, walked some distance to an old PWD rest house that had been booked in advance. The facility had seen better times during the Raj — “comfortable bungalow”, according to the 19th century explorer Sir Aurel Stein – but even now, it wasn’t too bad for a night’s stay. A hot bath before sleep and, a hearty open air breakfast at the nearby River View Hotel put us in top gear for the next leg. Hunza evokes thoughts of a fabled land where everyone lives long, and happiness seems to be a gentle breeze that blows the year round. We had been to Hunza previously in hurried affairs, but never as merrily as this time, on bikes. Leaving Chalt, which also marks the northern limit of Gilgit District, we had to negotiate a steep climb over a highway that suddenly was no more. The KKH was under major repair from Chalt onwards, and we found ourselves huffing and puffing over gravel and shingle, an ordeal that was to last till our final destination, all of the remaining 200kms. As we approached Hunza’s main commercial town of Aliabad after a very steep 50km leg, which took us nine long hours to cover, courteous adults and cheerful children made us feel quite welcome. Following the unfortunate spate of sectarian killings a few weeks earlier, tourism had come to a complete standstill in the region; now, we seemed harbingers of better times to the locals. Having no energy left to climb yet another 2,000ft to the Eagle’s Nest Hotel perched atop a sheer cliff beyond Duikar village, we hired a pick-up to haul our bikes. Just in time to catch the ginger and orange glow of the setting sun bouncing off the snow-clad mountains, we enjoyed the dazzling spectacle from the hotel terrace. Not too far in the sky, the crow-like Red-billed Choughs (Pyrrhocorax pyrrhocorax) in their glossy black plumage could be seen performing some spectacular aerobatics in the mountain updrafts. While climbing up, we had noticed scores of youngsters returning to their homes in the nearby towns after a day-long picnic at Duikar. Interestingly, there was no segregation, much like the rest of Hunza and, one wondered if this might be one of the possible reasons for bliss in the happy valley! Later at the hotel, a short dinner for two turned out to be a huge serving for four; though not quite a master of Burushaski, I suspected that the order for alto (two) was conveyed as walto (four) by the waiters to the cooks. Well fed and tired to the bones, we were almost sleep-walking back to our rooms. 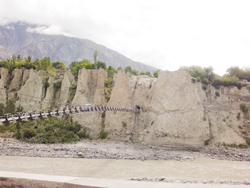 The third leg promised to be different as we had to negotiate the 18km long Attabad Lake that, in one of the vagaries of Nature, came into being three years ago as a result of a massive landslide damming the Hunza River. We arrived at a dirty little jetty, where disorder and confusion vied with dust and a merciless sun to rile the coolest of nerves. It took some tough shouting to ensure that our bikes were not mishandled as they were hauled onto the boats. Thereafter started a 90-minute ferry, what with a deafening putter of the diesel motors for a serenade, as we watched the reflection of the towering mountains in the turquoise waters of the lake. Disembarking a little short of Hussaini, we found ourselves in Gojal Tehsil or the Upper Hunza Valley, where Hunza’s Burushaski language gives way to the Afghan-linked Wakhi for the most part. Already tired and profusely hungry, the stretch from Hussaini onwards to Pasu was torment for our lower limbs. We had to get off the bikes when even the lowest gear refused to generate forward motion over the precipitous mountains. After a good two hours of lugging our wobbly selves along with the bikes, we finally hit downhill. In the fading light of the day, a ‘Welcome to Pasu’ road sign came as a godsend and we raced to get to Sarai Silk Route, a small but adequate hotel. As everywhere else, our requirements centred on a hot bath and enough to eat, both of which were available promptly. Over dinner, our waiter who preferred to speak only in English, explained that he was basically a tourist guide and in this lean season, was doing odd jobs. Those with better means were offering the services of their vehicles to the locals to get to the ferry at Hussaini and back. 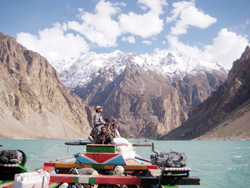 The Attabad Lake has hampered the movement of tourists as well the locals, who have to pay hefty amounts to get their goods across. A permanent solution seems years away, though it is my considered opinion that two modern berths at either end, suitably equipped with cranes to service heavy duty barges, might be a functional interim solution. The hearty dinner we had at Pasu gave us reason to rest an extra day, for Shahid had taken ill not long after the meal. In the meantime, I sauntered around the apricot and apple orchards and, took some striking pictures of the Cathedral Spires that are best visible from Pasu. The day after, we set course for the fourth leg to Sost, which is the dry port for trade with China via the Khunjerab Pass, 80km further east. After another arduous day of cycling which saw us through the beautiful village of Khaibar — where everyone looked like a Bosnian or a Croat —we arrived in Sost. A rather shabby town despite the natural beauty all around, we were hard-pressed to look for accommodation. Due to an unusual influx of two busloads of Japanese tourists, the PTDC Motel was fully booked; however, we were permitted to set up our tents at the little camp site in the hotel premises. Once again a hot bath and, some very appetising food served by a most eager-to-please waiter Shamsuddin, lulled us to an early sleep. It was a wonder that, having biked for more than 200 kms over a rubble of a highway, our cycles held out, with not even a puncture to stop our progress. We were glad that much of our cycling was over, but in all earnest, we knew that the remaining trek wouldn’t be Boy Scout stuff. Physical rigours had expended the last of our calories and will power had been sapped to the last grimace. Kilak Pass was still 7,000 feet above and, a perilous 55 kms beyond. Our trainer in boot camp of yesteryears, the late Sqn Ldr Sabir, had always reminded us that when all else is spent, determination surely lends a helping hand. We had loads of it and it was time to tap into this resource.